This is an awesome list of all the high frequency spots in the Mt Shasta area. 12 years of Mt Shasta experience facilitaed this list of sacred spaces to share with you! Enjoy and have a GREAT ADVENTURE! Mt. Shasta is a well known international spiritual center. As gateway to the slopes of Mount Shasta, it has attracted groups and individual spiritual travelers interested in spending time in quiet contemplation on the mountain. The town is home to numerous spiritual teachers, New Age entertainers, and alternative health practitioners. Summer pageant in August “I Am Come” www.saintgermainfoundation.org/pageant.htm The "I AM" COME! Pageant has been presented annually since 1950 at the G. W. Ballard Amphitheater in Mount Shasta, California, USA. The Pageant was originally created, produced and directed by Mrs. Edna W. Ballard, who with her husband, Guy W. Ballard, established the Saint Germain Foundation. Mrs. Ballard's objective was to present a Pageant on the life of Beloved Jesus, focusing on His Miracles of Truth and Healing, and the example of the Ascension which He left to the world. Local hiking trails http://www.siskiyou-county-online.com/Hiking_Trails.html this is a great link to many favorites places! The Mt. Shasta City Park is the site for the headwaters of California's Sacramento River. Even in the driest years, waters from this plentiful spring gush endlessly from a mossy rock face. The water is pure and safe to drink right out of the spring. The park is often busy with children playing and families picnicking, but the area around the headwaters spring retains an almost cathedral-like peace. Walk along the creek and follow footpaths that meander across small bridges through hedges of horsetail fern and fragrant willow. The Elsa Rupp Nature Trail is a peaceful walk through forests and historic Strawberry Valley wetlands. Look for the parking area on the east side of Old Stage Road just north of the Sisson Hatchery & Museum. Black Butte, once known as Muir Peak, is a "plug dome" volcano located between Mt. Shasta City and Weed. It has sometimes been called a cinder cone, resulting from one of Mount Shasta's many eruption, but is actually a separate volcano, complete with a well-defined hiking trail to the summit. The trail head is reached from a bumpy Forest Service road that is to the left as you drive up Everitt Memorial Highway. The Forest Service road is about 2 miles from the Mt. Shasta High School and is marked by a sign that says "Penny Pines". Take a left here and follow the dirt road for approximately 2.5 miles. When the dirt road crosses the overhead power line, take the dirt road to the left, go about 1/2 mile until you reach the trailhead. The distance from the trailhead to the summit is about 2.5 miles and the climb takes 2 to 3 hours. The magnificent 360º view from the summit, at 6325 feet altitude, will revive and refresh your body and spirit for years. Be sure to wear proper hiking shoes. Take plenty of drinking water and wear sunscreen. 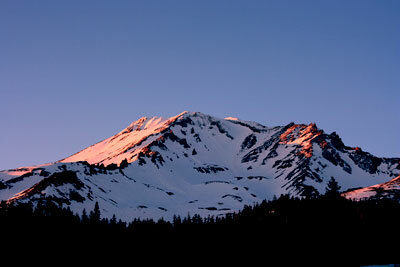 Drive up Mount Shasta on the Everitt Memorial Highway (just follow Lake Street up out of the center of Mt. Shasta City past the high school). After you drive approximately 8 miles, you will see the sign for the popular Everitt Vista Point 1/2 mile before the destination. The view west over the valley from your car is breathtaking, but if you walk through the parking lot and take the trail starting next to the restroom facility, you will soon come to a stone lookout which affords a panoramic view to the south. On a clear day you will see Mount Lassen and Castle Crags in the south, with the sweep of the Eddy Mountains and distant Marble Mountain Wilderness Area to the west. The Everitt Vista Point lookout is the location of frequent "star parties" during the summer, where local astronomers bring their telescopes and binoculars for the celestial show. Check the local paper the Mt. Shasta Herald, to see if a star gazing party is planned during your stay. Panther Meadows is one of the most beautiful locations on Mount Shasta, with the purest spring you will ever find, and the most pristine energy in which to meditate, sleep, camp, etc. This area and its campground are reached from Everitt Memorial Highway, and is a short distance from Bunny Flat. The campsite is located in Lower Panther Meadows and is maintained by the Forest Service, so their regulations apply to all camping here. There are ten campsites, no drinking water, and vault toilets. The campground is open in mid-June through Labor Day, depending on weather conditions. A 2-hour hike past Panther Meadow trail. A great place of purity and beauty. Bring all you will need for the day. Camping is suggested only in the stable summer months. Follow signs from Mt. Shasta City south on either Old Stage Road or Ream Ave. to reach Lake Siskiyou. Drive over the dam and park across from the Castle Lake Road turnoff. Here you'll discover a dirt road leading down to the lakeshore...a perfect spot for a picnic on a warm Spring day. Drive over the Box Canyon Dam at Lake Siskiyou and take the Castle Lake turnoff which soon appears on your left. This beautiful drive leads to Castle Lake. Approximately 1 mile before you reach the lake (6 miles from the dam) the road turns sharply to the right. Pull off to the left at this turn. A little roadway winds behind a stone outcropping, with plenty of space to park. Before your eyes you will discover one of the most dramatic views of Mount Shasta in our entire region! Come here in the early morning for sunrise ceremony, or late in the day to enjoy alpenglow on the mountain as the Sun sets in the west. Castle Lake is an incredible wonder, surrounded by mountains with rocky cliffs on the south face. This lake is a must visit while you are in the area. To reach Castle Lake, turn onto Castle Lake Road just past the dam at Lake Siskiyou, south of Mt. Shasta City, and follow to the parking lot next to the lake. Hikers can follow the trail along the east side of the lake to heart-shaped Heart Lake nestled in the cliffs high above. This hike is well worth the effort. The Pacific Crest Trail traverses the ridge above Castle Lake, in case you're inspired to hike on north to Canada. To reach these lovely waterfalls, drive past the small town of McCloud and continue about 6 miles further on Highway 89 to the turn-off for Fowler's Campground. Turn at the sign and drive less than 1 more mile to the McCloud River. Both Upper and Lower Falls are easily accessible by car, while the hike to Middle Falls is beautiful. This trail begins at Fowler's Campground and the distances are marked at the trailhead. Bring lunch or a snack and plenty of drinking water. Each of the three falls has its own personality. At Upper Falls, the quiet river gathers itself into a massive stone chute, charging the waters with enormous energy before they spill into a pool far below. Middle Falls, the most inaccessible, spreads a sheet of falling water over a lava cliff. Lower Falls is a wonderful spot to rest, picnic and play. Watch for the tiny Dipper bird which flies low and plunges in and out of the cascading water. The area that Medicine Lake is in is one of the most unique geological areas of North America and has much to offer. There are 72 campsites for overnight stays on a first-come, first-serve basis. There is a sandy beach and designated swimming area. The lake offers boating, swimming, water skiing, fishing, camping and picnicking. For more information call the McCloud Ranger District in McCloud at 530-667-2246. Accessed from Highway 89 from McCloud, Glass Mountain covers 4210 acres of black volcanic glass, called obsidian. This mountain exhibits the results of multi-stage volcanic activity so recent that there has been no modification by weathering, erosion or vegetative cover. Wear good leather gloves and be careful not to slip as this "glass" can cause serious injury. Parking and access to Hedge Creek Falls is at the north Dunsmuir I-5 interchange. the trail begins to the right of a picturesque gazebo. It is only about 500 feet, but includes steps and areas that are steep, so please watch your step. Lava from Mount Shasta flowed into this area many thousand years ago. The Sacramento River has cut a path through this basaltic rock, and tiny Hedge Creek spills over the lip of the ancient flow, splashing through space to a pool below. You will see how the gentle waters, over time, have cut a groove in the solid rock, and learn about the power hidden in a tiny creek. These falls are unique and beautiful in that they cascade from multiple sources on a high, moss- and fern-covered bank and fall into the Sacramento River. The trail to Mossbrae Falls is actually the gravel right-of-way for the railroad tracks. To get there, take the road off North Dunsmuir Ave. into the Shasta Retreat. Cross the bridge over the Sacramento River and park. Walk north about 1 mile and when you see the train trellis, look to the right for a short trail leading to the falls. During the walk to and from the falls, expect to encounter at least one train. You will be able to hear the engines for several minutes before you see them, which will give you plenty of time to step to the side where you will be safe. Keep to the outside instead of the rock face. Be assured, it is a uniquely beautiful sight and well worth the trouble getting there. Many trails, from high alpine cliffs to riverfront strolls, are perfect for hikers and day visitors at Castle Crags State Park south of Dunsmuir. At this 10,500 acre park you'll find towering granite spires, steep-sided canyons and a few alpine lakes. Most of the area is covered with high brushfields and rocky outcrops with a few wet meadows in the creek headwaters. Elevations range from 2000' along the Sacramento River to over 6500' at the summit of the highest crags. In the Spring, the numerous dogwood trees in bloom are an enjoyable sight all along the hiking trails which are well maintained. You can also access the Pacific Crest Trail from the park. Maps will be available when you register at the park's entry station. You can also call the Park Ranger at 530-235-2684 to get more information. This unique 100-year old resort is located on pure, rushing Parks Creek a few miles northwest of Weed. Open to the public certain times during spring, summer and fall, it features therapeutic hot mineral baths, individual private tubs, sauna and massage. Native American purification sweats are held periodically. Lodging is available. This is an ideal place for workshops and seminars for groups of 30 or more. To get there, take Interstate 5 Edgewood Exit and follow signs to 4617 Stewart Springs Road, phone 530-938-2222. During Mount Shasta's many eruptions lava oozed slowly over the landscape, filly gullies and narrow valley. The outer edges cooled more quickly leaving hollow lava shells called lava tubes. Pluto Caves are an easily accessible example of the thousands of lava tubes, many undiscovered or kept secret, which pepper the landscape in the Sacred Mountain Region. Pluto Cave has held sacred significance for Native American Tribes for hundreds of years. Sadly, its accessibility has led to misuse by thrill seekers, but the experience is worth the hike into these eerily magnificent caves. Wear hiking shoes, go in pairs and take flashlights and extra batteries. To reach the Caves, go out Hwy 97 approximately 12 miles to Road A12. Turn west, and go 3 miles. Slow down, and watch carefully on the left for a telephone pole with "Pluto Caves" in silver letters attached directly to the pole. Turn left and drive about 2/10 of a mile to the dirt parking area. Follow the rock edged walkway to the Caves. The Living Memorial Sculpture Garden, set at the edge of the Shasta Valley northeast of Mt. Shasta, was dedicated as a war memorial, but the larger than life metal sculptures evoke a powerful sense of striving for peace. The sculptures are arranged within walking distance of each other with the stark landscape and lovely distant view of Mount Shasta as a backdrop. To get to the Gardens, drive out Hwy 97 from Weed about 12 miles. The turnoff to the Gardens is one mile past Road A12. the highway will take you into the high desert area of the Sacred Mountain Region. The stark arid landscape sets off the magnificence of the northern slopes of Mount Shasta. If you have more time available, you may want to include a long day trip to Tule Lake, Petroglyph rock, and Captains Jack's stronghold. Tule Lake is a natural wildlife preserve and any time of the year you can see all kind of abundant wildlife. In Jan-Feb. you can be amost assured to see bald eagles! Petroglyph Rock is near the Lake and is a cliff that has ancient Indian carvings. We find this site extremely powerful and the site is guarded by a pair of falcons and you may see a owl too. Captains Jack's Stronghold is a site where the Modok Indians held off the cavalry for nearly a year. When you enter the stronghold you can feel the presence of the spirit of Captain Jack and also feel the presence of ghost dancers. The ghost dance site is not marked but you will find it with you intuition. To get there, go on Interstate 5 north from Mt Shasta and exit at the Central Weed exit, where there will be a sign for highway 97. Go through Weed and take 97 for about 50 or so miles, going through the small town of Dorris on your way and continuing on 97 to Highway 161. Go east on 161. Tule Lake is on highway 161, and there are many dirt roads to explore in the Lower Klamath National Wildlife Refuge. To get to Petroglyph rock, take 161 to Highway 139. Take a right, and go south on 139 and follow the signs to Petroglyph rock. Captain Jack's Stronghold is further south on 139, and is part of the Lava Beds National Monument, where you can also explore many incredible ice caves and lava tubes. Remember when entering sacred areas to ask permission from the guardian spirits and enter with honor and respect. Aluna Joy was a resident of the Mt Shasta area from 1986 to 1999, and hopes to one day call it home again.